1. 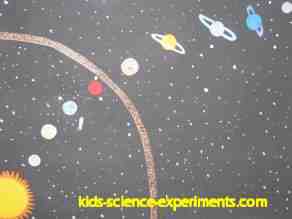 Cut out different sized planets, moons, stars, comets, meteorites, rings and a sun. 2. Place all of your Solar System on the black poster paper and then glue each one to the paper. Our Solar System : is made up of the Sun and everything that orbits it [the nine (eight) planets moving in elliptical orbits around it]. There are also a lot of asteroids (small lumps of rock). The moons orbit the planets. Mercury and Venus are the only planets that do not have any moons. The Sun's gravity keeps the planets and a variety of other objects, including comets, moving the way they do because of the Sun's orbit. Sun : (Sol) :The Sun is a star, a huge ball of gases - mainly hydrogen and helium. Stars make their own light, heat and energy. It takes eight and a half minutes for our Sun's light to reach our plante Earth moving at 300,ooo km (186,451 miles) a second. The sun is the largest object in our Solar System. Millions of stars form a galaxy. The stars in a galaxy are held together by the force of gravity between them. There are millions of galaxies in the Universe. All the planets orbit the Sun in the same direction. All the planets are made up of different materials. Their differences are mainly the result of their different distances from the Sun. Mercury : (Morning Star/Evening Star) – Mercury is a very small planet and is the closest planet to the Sun. This planet is extremely hot during the day and very cold at night. Mercury is mainly made up of iron. Mercury does not have any moons and is so much smaller than Earth. It is covered with craters. Venus : is Earth’s system planet – it is identical in size to Earth. It is the closest planet to Earth. This planet is different from all the other planets as it spins backwards. Its poisonous clouds trap the Sun’s heat, making Venus the hottest of all the planets. Venus does not have any moons. Earth : Earth is the only planet in the solar system to have life discovered. It is the same size as Venus. Earth is the third rock from the Sun. Moon - Earth has one moon called Luna. The Earth's Moon :Your weight depends on your mass and on the strength of the Earth's gravity. The moon is smaller than the Earth, so its gravity is less. The moon's gravity is about one-sixth of the Earth’s gravity. If you could go to the moon your mass would be the same, but your weight would be less. Mars : Sometimes called the ‘Red Planet’ because the rocks and soil are a reddish brown colour. Mars is much colder than Earth and is about half its size. Moons - Mars has two moons call Deimos and Phobos. Jupiter : is the king of the planets. It is the first and largest of the giant gas planets. It is beautiful coloured with streaks and swirls caused by winds and storms – Jupiter has a big Red Spot which is a giant storm. Moons : Jupiter has 63 moons. Saturn : is the second largest planet and has more moons than any other planet. The rings of Saturn are bands of ice and rock and they are bright and very beautiful. Uranus : is bigger than Earth and spins on its side. It is identical to Neptune . Uranus is a bluey-green ball made of gas and water, with molten rock at its centre. Moons : Uranus has 27 moons. Five are large and the rest are small. Neptune : is the smallest of the gas giants and has very dark rings. It is a blue ball with many white clouds. Neptune has a giant storm much like the storm on Jupiter ‘The Great Dark Spot’. It has six rings which circle the planet. Moons : Neptune has 13 known moons. Pluto : Pluto was changed from a planet to "The Dwarf Planet" in 2006. Because it is so small many scientists don’t consider it a planet at all. Moons : Pluto has 3 moons. Mercury, Venus, Earth, Mars and Pluto are rocky planets. Jupiter, Saturn, Uranus and Neptune are made mainly of gas. Inner Planets : The four planets closest to the Sun are known as the inner plants. They are rocky planets. 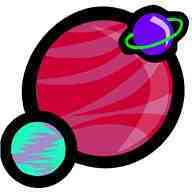 Outer planets : The other planets are the outer planets. Except for Pluto, the outer planets are made of gas. Comets : are made out of dust and ice, kind of like a dirty snowball. Comets are soaring beacons with their beautiful tails. Atmosphere : our Earth's atmosphere is made up of a transparent mixture of several gases surrounding our planet and held by Earth's gravity. The mixture of these gases is known to us as air or oxygen. Our atmosphere protects our life on planet Earth by absorbing the ultraviolet solar radiation and reducing the temperature extremes for night and day.